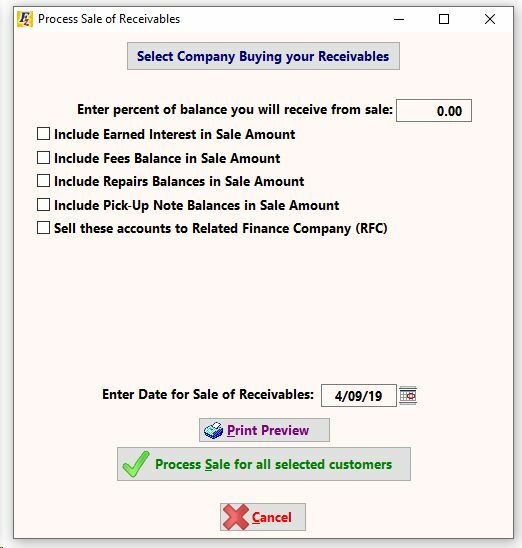 To manage and track customers sold to either a related finance company (RFC) or any other finance company, go to Customers >> 3 - Sales of Receivables. Click on . 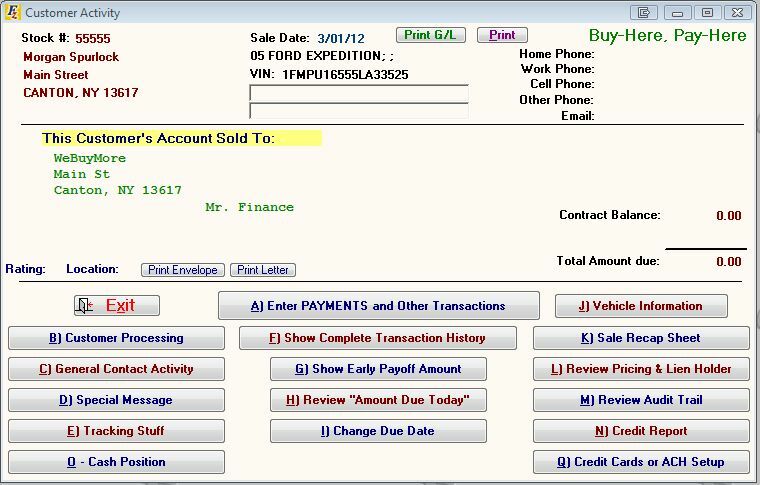 In the Customer Look-Up window, the account to be sold. Repeat if selling more than one account at one time. 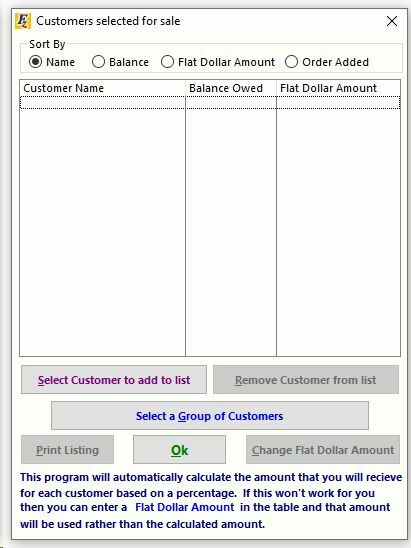 Click on a Customer in the list and then click Change Flat Dollar Amount to set the dollar amount on each individual customer, if you know this information. 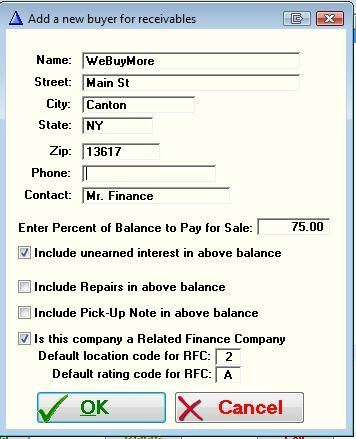 Click on to enter the default information for the company purchasing the account(s). Be sure to enter a Location Code for the buyer. 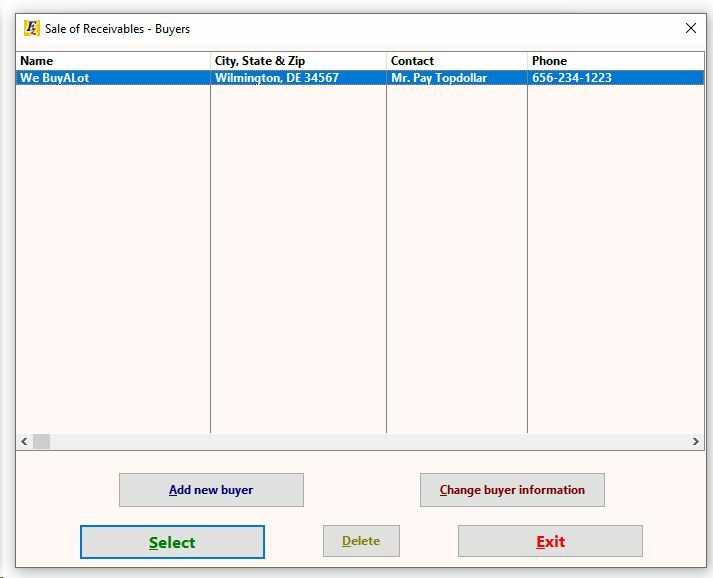 The location code will be assigned to the vehicle purchased so that reports may be generated separating the sold accounts from the original sales to customers. Click then to choose the appropriate buyer. 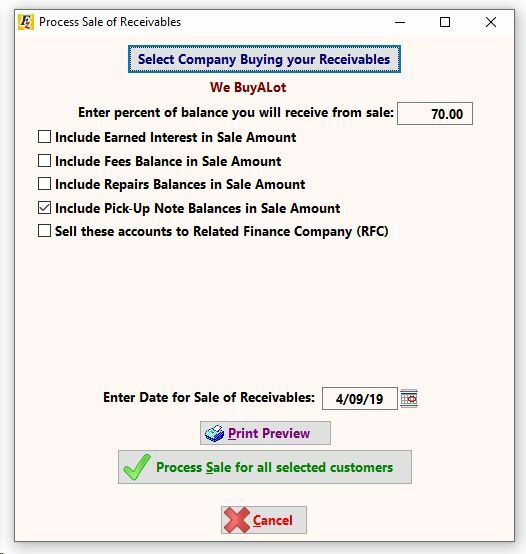 If the information entered is correct, including the date of the Sale of Receivables, click on to view or print a report of the selected accounts. Click on if the information entered is correct. The report will appear again on the screen after the sale is processed. To see the results of the processed sale, click on and choose to show . If the account is sold to the dealership's Related Finance Company, two accounts will appear for the customer. The original account has a zero balance. Click to open the account. Click on to view how this affects the transaction listing for the original account. 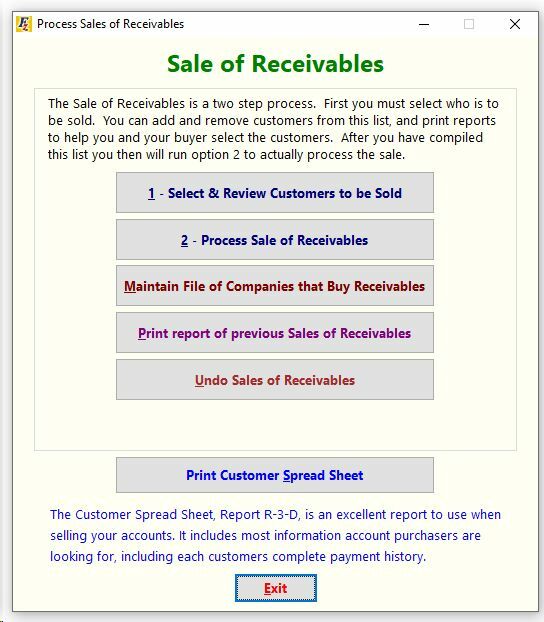 The General Ledger for the original account shows the initial transactions and the Sale of Receivables transactions. To open the purchased account (if sold to a Related Finance Company), click on and choose to show . The purchased account has an "s" at the end of the stock number and a balance. 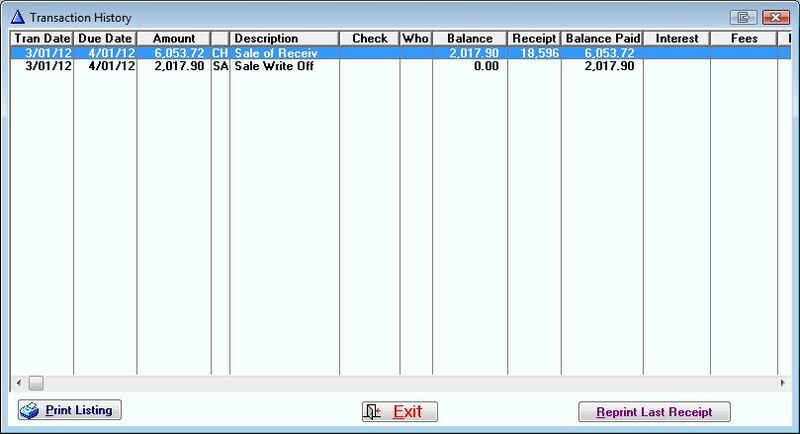 The account type is purchased and shows the customer's current balance. Payments from the customer are entered into the purchased account going forward. 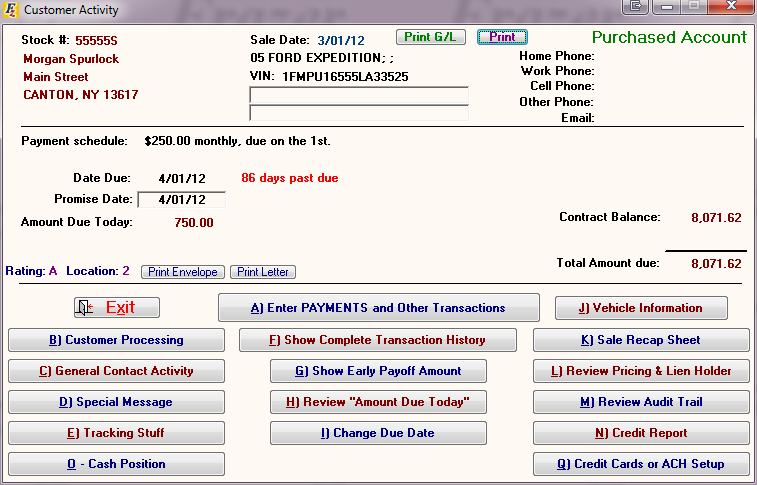 Click on to view how this affects the transaction listing for the purchased account. 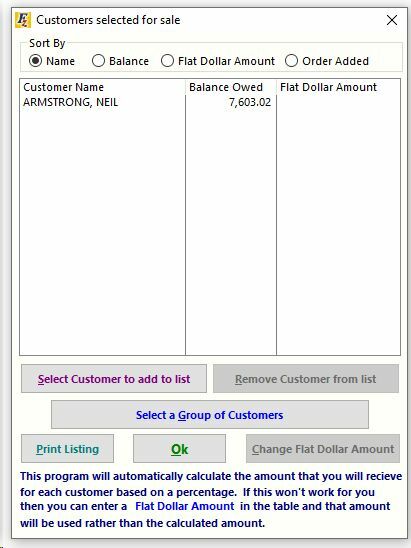 The General Ledger for the purchased account shows the amount owed by the customer, as well as the amount received as part of the purchase of the account. The Unearned Discount is the difference between the amount owed by the customer and the amount for which the account was purchased by the related finance company, minus the sales tax. If the original account was sold to an outside finance company, no second account will appear in Customer Activity. The outside finance company handles the purchased account and accepts payments from the customer directly.